As the resolution of screens keeps going up and computer users age, the two are leading to a situation where what’s known as assistive technologies are proving critically important for a wide swatch of users. 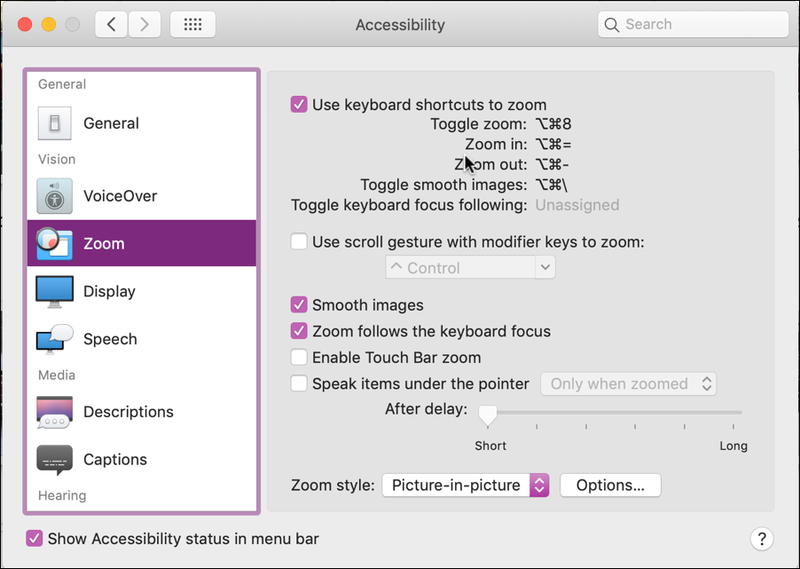 Apple’s always been on the forefront with this, offering up integrated features that help people who are visually impaired, have hearing issues, color perception problems and even motor control challenges. All known in the industry as “assistive technologies”. These aren’t technologies that are an optional install or part of a different version of MacOS, however, they’re all sitting and ready to utilize on any Mac – or iOS device like your iPhone – whenever you’d like. The primary categories are listed on the left side. Notice that they’re organized by assistive technology type: Vision, Media, Hearing, and (not shown) Interaction. You can experiment with the other features if you’d like, but I clicked on “Zoom” to enable that capability. The right side has all the many, many ways you can tweak or modify Zoom to make it work for you. To start, check out the Zoom style menu at the bottom. My preference is “Picture-in-picture”, as shown, but check the other options out if you’d prefer the entire screen become bigger. To start, perhaps leave it with the default settings (shown above). The most interesting of these is ‘invert color’, which can be great if you have any sort of color deficiencies with your eyesight: at any time you can have a portion of the screen “flip” colors as needed. Looks good? 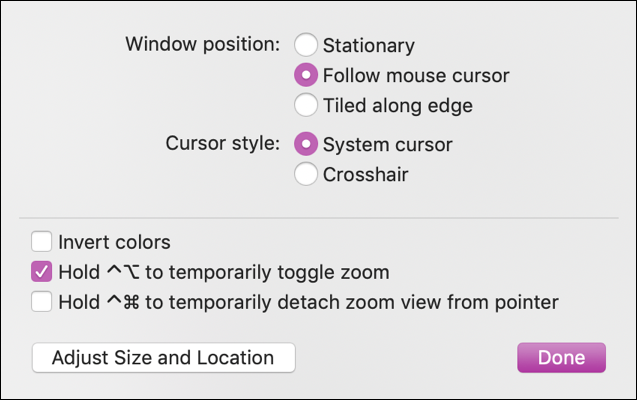 Click “Done”, then back on the main Accessibility window, click to enable “Use keyboard shortcuts to zoom”. Now the fun part. Close the window and go back to what you were doing – perhaps reading this very page in your Web browser. Note: I had to take a photograph of the screen because the screen capture software doesn’t know that the accessibility utilities are enabled and therefore doesn’t “see” them. A bit weird. Quite useful even if you have splendid vision, actually. Done for now? Press Options + Command + 8 and the zoom rectangle will vanish. Pro Tip: I have lots and lots of Mac help and tips here: I’ve been writing about the Mac since I started on Apple gear with the Apple II. Yes, it’s been a long journey!